Unnamed Cemetery #18 on Begonia Dr.
From the Hancock County Courthouse, go southwest on Hwy 22 for 7.2 miles to the intersection of Hwy 22 and Main Street in Devereux. Turn right (at the backward fork) onto Main Street and go 0.2 mile until it dead ends into Jones Chapel Road. Turn left and follow Devereux / Jones Chapel Road for 4.9 miles to Carr Station Road. Turn right on Carr's Station Road and go 3.7 miles to Lake Sinclair Drive. Turn right on Lake Sinclair Drive and go 3.8 miles to Island Creek Drive. Turn left on Island Creek Drive and go 2.4 miles to Begonia. Turn left on Begonia and go 0.2 mile (or less than 0.1 mile past the intersection of Begonia and Rosebud Ct.). Park and walk up the hill about 150 feet from the road. Last initial very faint and difficult to read. A small stone with what appears to be some initials faintly carved. 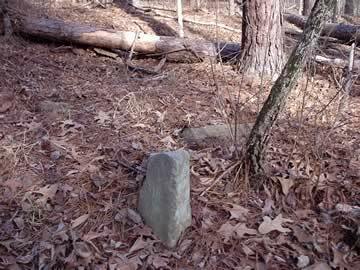 24 graves marked by fieldstones and depressions. Many others possible. Dates possible ending in "26" and "88" or possibly 26 years old. Name begins with "Wilbu" and is probably Wilbur, with the "r" on the next line.